Funding from the University of North Carolina Library supported the electronic publication of this title. 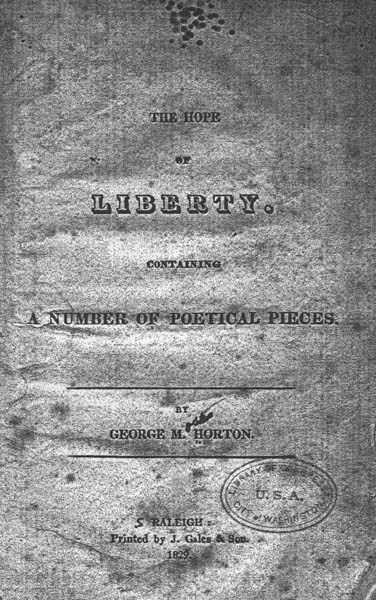 (title page) The Hope of Liberty. Containing a Number of Poetical Pieces. Printed by J. Gales & Son. African Americans -- North Carolina -- Poetry. Slavery -- North Carolina -- Poetry. Slavery -- United States -- Poetry. Slaves -- North Carolina -- Poetry. A NUMBER OF POETICAL PIECES. GEORGE, who is the author of the following Poetical effusions, is a Slave, the property of Mr. James Horton, of Chatham County, North-Carolina. He has been in the habit, some years past, of producing Poetical Pieces, sometimes on suggested subjects, to such persons as would write them while he dictated. Several compositions of his have already appeared in the Raleigh Register. Some have made their way into the Boston newspapers, and have evoked expressions of approbation and surprise. Many persons have now become much interested in the promotion of his prospects, some of whom are elevated in office and literary attainments. They are solicitous that efforts at length be made to obtain by subscription, a sum sufficient for his emancipation, upon the condition of his going in the vessel which shall first afterwards sail for Liberia. It is his earnest and only wish to become a member of that Colony, to enjoy its privileges, and apply his industry and mental abilities to the promotion of its prospects and his own. It is upon these terms alone, that the efforts of those who befriend his views are intended to have a final effect. hands of some person, who will humanely consent to receive them, and give notice to Mr. Weston R. Gales, in Raleigh, of the amount collected. As soon as it is ascertained that the collections will accomplish the object, it is expected that they will be transmitted without delay to Mr. Weston R. Gales. But should they ultimately prove insufficient, they will be returned to subscribers. And reign the lord of earth. And struck the march of time. With joy from chaos rise. And touched on every string. And Heaven was drown'd in song. O'er all the worlds around. And bid your chorus flow. Upon the flood of praise! ON ACCOUNT OF THE IMAGINARY FLIGHT OF HER SUITOR. Nor brood with silence in the vale. The dirge of long lamented love. Which makes thee droop thy sounding wing? Forbid thy tragic voice to sing? Whilst all the vallies frown below? And tear thy pleasures from thy breast? And rob thee of thy peaceful rest. Nor let a princess grieve alone. Never--no, never more to part. And thus together dwell for aye. And fly forever from thy bride. And all my secret thoughts betray? My heart flies off with thee at last. Nor from my heart the weight remove. And gull thy fav'rite with a smile? And beauty wings my heart away. To gain the object of my mind. Farewell--I fly with love away! Farewell--I'm gone with love away! I'd to thy smiles retire. Or what induced thee to deceive me? I shun the lass who thus will grieve me. To woo thee while another take thee. I grieve to give thee up forever. Compell'd to live and die without thee. Still forever fare thee well!" I think of no other, my true-love, but thee. I fancy no other, my true-love, but thee. Why cannot a maid with her lover agree? I pine for no other, my true-love, but thee. And languish until I am fancied by thee. ON THE DEATH OF AN INFANT. ON THE TRUTH OF THE SAVIOUR. The strange event to see. Who will all things restore? With strength rise up and run. As shades from morning's wing. The dead obeys his call. And drop her flowery crown. And find a remnant still. And owned its God divine. When none can work as he? And all the Host of Heaven! Hail, thou auspicious vernal dawn! The pleasing smiles of Spring. Which floats on gentle gales. And thus your charms display. To invite them as they rise. The lavish pomp of May. And smile on every bloom. Which ne'er shall cease to ring! And thunders roll along the skies. From which they strive with awe to fly. Which drives away the gloom of fear. And sound in front the nightly strain. And well her rising stock supplies. Which lurks beneath the smiling scene. She patient waits her young to see. And ruminate beneath the shade. Regardless of his driver's rod. While plenty smiles on every tree. 'Tis paradise to human sight. A large supply of golden grain. Which charm'd the ear before. Which feared to come in sight. Their sweet and pleasant shades. The beetles rise no more. Along the heath is o'er. Which chill the breeze of song. And Winter sweeps the whole. We shed the rose of prime. And beauty's sun goes down. When youthful charms have fled. ON THE DEATH OF REBECCA. Thou sample of virtue and prize of the brave! They now are but food for the worms and the grave. The same doleful trump will soon call us all hence. But looks not behind on the frowns of the grave. And cry, "Happy stranger, thou art welcome at home." And leaves the frail body to rest in the grave. Whilst death like a bridegroom attends her away. Resign'd in a shroud to a peaceable grave. Like sudden storms of wind and thunder rise. And sighing zephyrs whisper of the dead. And seems to show the living number less. And grieve for one who lies so near her heart? Or faint to hear his last departing groan. The last pulse beats, and in her arms he dies. And silent owns the fatal sentence just. And almost make the stubborn rocks bewail. Whose fatal stroke invades the creature's breath! And strikes the deepest awe within the bravest soul. ON THE EVENING AND MORNING. Till all the candles in the concave burn. Whilst in the air the meteors play along. [illegible] the eye to her resplendent feast. 'Till might is swallowed in the flood of day. And bleating flocks may venture from the fold. Thou ancient goddess of the hunting race. And lo, the dairy maid salutes her bounteous cow. With music on my tongue. And leaves the noise behind. Doth far 'bove nature gaze. ON THE CONSEQUENCES OF HAPPY MARRIAGES. For all the smiles of mutual love are Heaven. Whilst discord sinks beneath their soft control. Attractive as the magnet to the steel. Whose bosoms burn with pure connubial fire. Their light may shine on ages yet to come. Like Vesper's torch transpiring in the skies. Sweeter than odours is a virtuous name. [illegible] eflecting lustre on a future race. Exulting from a funeral sacrifice. On hearing of the intention of a gentleman to purchase the Poet's freedom. And sought the peaceful haven of delight. And hope, it vanish'd in the clouds of fear. And lo! the sacred muse resumed her wing. Or prostrate fall beneath her burning feet. Whose melting voice the stubborn rocks obey. And vegetation smiles above the blast. When every Grecian bosom swell'd with joy. And music breathed my gratitude to heaven. In such distress, who could forbear to weep? Toss'd by the headlong billows of the deep! Gave way, and to a more substantial flame. And yield with pleasure to their soft control. Along the dismal path will prove my guide. And the last beam of hope was almost gone. Perform his task with joy, when thou art near. And to the prowling monster fall a prey. The death-bound sheriff is not far behind. The victim of a melancholy fate. [illegible] ith care the lab'ring animal to shield. And gently lays them down at night to sleep. No never, never, whilst on earth I stay. And after death, then fly with me away. THE LOSS OF FEMALE CHARACTER. She wanders a nocturnal rover. Instead of the heart-cheering ditty. When pendent o'er Babylon's water. And leave her dethron'd and confounded. Whose flight to her soul must be bitter. He sets; but to rise again never! And darkness conceals her forever.